It’s worth another look at a chart that I drew earlier this month which then indicated that the market would dip and the rand gain strength. 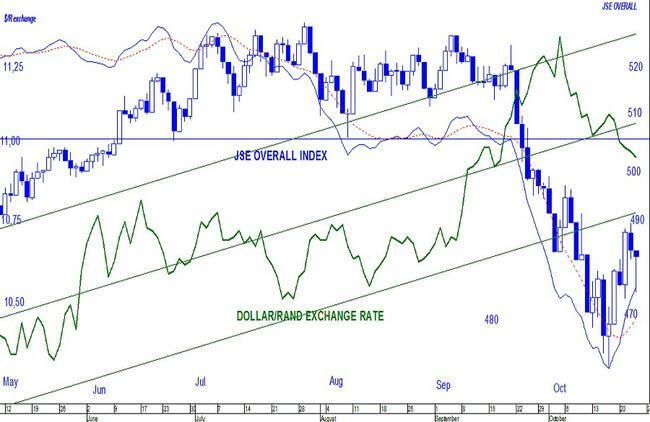 The rand is still gaining strength, but the market is improving and likely to continue doing so. The much needed strength in the rand is continuing (fewer rands are needed to buy a dollar) and shown by the plotting heading downwards. To make sure that this encouraging movement is likely to continue, I have overlaid a standard error channel, the green upward sloping lines. The center line is the equilibrium (the level to which the plotting is expected to return) and the two outside lines boundaries, which indicate that the subject (this time the JSE-Overall index), have moved too far in either direction. A break above the upper line shows that the subject has moved too high to maintain this level, and a break below the lower line, that the subject has moved too low to maintain this level. A break above the upper line happened in late September, early October – it took too many rands to buy one dollar. The plotting has since fallen to below the center equilibrium showing that it is perhaps moving down a little too fast, but is still far away from the lower error line. This tells me that I can expect this downward move to continue. If this downward move continues for a longer period, the slope will flatten, and begin to tip in the opposite direction. This would be wonderful for the country, but I am not placing any bets on it happening yet. Over the second plotting (blue candlesticks), I added a moving average convergence/divergence indicator (MACD) and its zero line, also in blue, but have indicated its signal line in red. The MACD is an excellent way of showing a shares current position, overbought or oversold, and indicate buy and sell signals. Anything above the blue vertical line is zero is positive, and anything below negative. The exception is when, the plotting is far above, showing that it is well overbought and likely to turn down, or far below, showing that it is well oversold and likely to turn up. This turning upwards has happened to the extent that it has broken through the red signal line giving a buy signal. My reading of the present situation is that the rand will continue to gain value against the dollar and the share market will continued upwards. As our shares are quoted in rands, this means that their intrinsic value will increase. I really liked your article , your article is very petrified me in the learning process and provide additional knowledge to me , maybe I can learn more from you , I will wait for your next article, thanks. © 2012 Copyright Ben & Jean Temkin All rights reserved.